Keramikos Area – Parking Facility – ΑΤΤΙΚΟ ΜΕΤΡΟ Α.Ε. This area is located at a distance of approximately 300m. from KERAMIKOS Metro Station, in a land plot owned by the Municipality of Athens, at the intersection of Pireos and Iera Odos Streets. In the past, KERAMIKOS Metro Station was planned to be constructed in the above land plot; however, due to problems related to the alignment of the Line underneath the archaeological area of Keramikos, the Project for the construction of the said Metro Station has been abandoned, although the area in question had already been excavated. The Ministry of Infrastructures, Transport and Networks made the decision to utilize the existing excavation creating, thus, an underground 5-level car park area with a total capacity of 270 spaces. 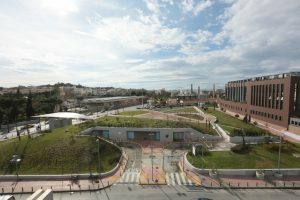 Within the framework of this Project, the area, covering approximately 9,000m2 was reconfigured and the park that has been created has been rendered to the Municipality of Athens.